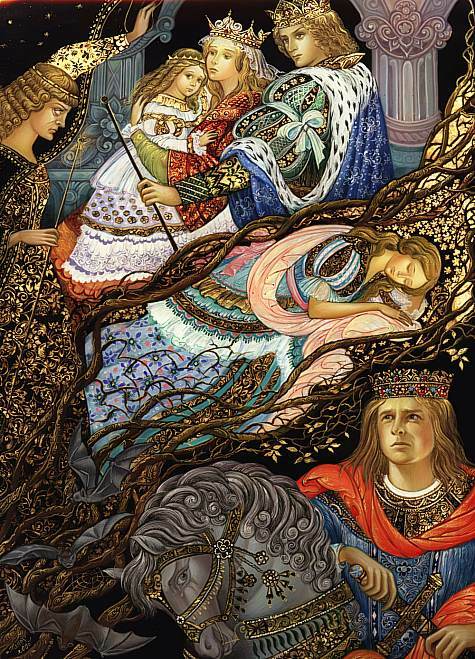 "Sleeping Beauty" is one of Smirnova's most intriguing works. In her own words "I love to paint princes and horses", and you couldn't find more handsome examples than the ones here. Moreover, the lovely flow and transitions from one area to the next in this work make it one of her smartest looking compositions. The radiant gold mixed among the tree limbs on the right give one the impression the the "beauty" is being well protected in her sleep. We love the grays in the horse and the bats, too. 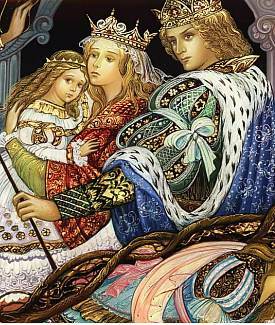 It's not a color that you see much on lacquer boxes, but Smirnova uses it here to a great effect. Please note: This exact box has already been sold, however Ms. Smirnova has agreed to do a similar one upon request. Some of the details may be slightly different, but the composition and spirit of the piece will remain the same. Depending on her work load, the normal time frame for this will be 3-6 months. She will be painting it just for you, and will allow the possibility for a minor change in the box should you desire one. The box will come with exquisite side ornamentation. If you are not happy with the box you receive for any reason, we will gladly refund the total amount paid. A down payment of 50% will be required for her to start work.